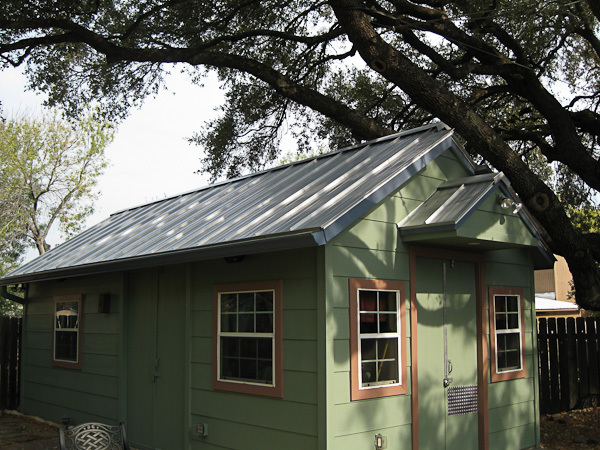 Long before "going green" became an industry buzzword, Straight Solutions was introducing Austin homeowners and builders to the benefits of metal roofing. Standing seam metal roofs offer a versatile look and maintenance-free roof protection that out performs any conventional roofing system. Standing seam metal roofing panels, sheet metal trim, ridge caps & flashing are custom fabricated in-house. 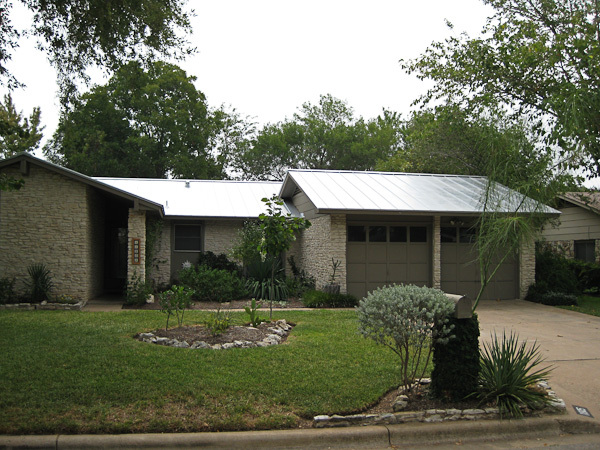 When it comes to standing seam metal roofs, no other Austin-area metal roofing contractor can match Straight Solutions’ experience or customer satisfaction. Straight Solutions serves Austin, and surrounding Central Texas communities including Bastrop and Elgin to the east; San Marcos, Kyle and Buda; north to Round Rock, Cedar Park, Pflugerville and Georgetown; and west including Lakeway and Marble Falls. Standing seam metal roofs are by far the longest lasting and most leak-resistant roofing option. Standing seam panels are cut to length and are attached with clips recessed under the panel, eliminating the holes left by screws and minimizing the potential for leaks. Straight Solutions offers standing seam options in either galvalume or a wide variety of colors. They weigh less than composition and tile roofs. They are made from up to 75% recycled materials. Depending on the type of metal roof you choose, your metal roof will last from 50 years to lifetime. They increase the energy efficiency of the building and make it easier to cool your home. They can be the ideal platform for solar panels and water collection units. Metal roofs mean fewer composition shingles in the landfill. They are not a petroleum-based product, reducing our dependency on petroleum production. Straight Solutions was established in 1981 by Austinite Clay Fuller. Clay’s vision was for a family-owned metal roofing business where integrity, accountability and quality are central to every project. Over the years, Fuller Enterprises steadily grew and gained a reputation for good work and good people. In 1994, Clay incorporated the business under the name Straight Solutions, Inc. – reflecting the company’s emphasis on standing seam metal roofing installations - and in 2008, transferred ownership to sons Brian and Ben Fuller. With so many roofing companies in Central Texas, why choose Straight Solutions? We have no salesmen or middlemen. You get the personal attention of Straight Solutions’ owners from initial project consultation through completion. We have a tenured team. Unlike many roofing firms, Straight Solutions’ team comprises a loyal, tenured employee family. In fact, our lead employees have been with the company from 10 to 23 years each! Straight Solutions’ reputation for quality and integrity is key to retaining great employees – and to gaining so many loyal repeat and referral customers. We fabricate our own sheet metal. Our in-house sheet metal shop can create everything from specialty trim to custom flashing. You save the mark-up of subcontracting to another shop, and we control the quality and production time. Each metal roofing panel is individually formed at the job site. Long or short standing seam panels can be made to desired length. We are small by design. We don’t want to be the "largest", just the best. By staying small, we can stay true to our vision of personal attention and unparalleled service to every customer. Just ask our customers. Complete the online form to get started on your roofing project. One of Straight Solutions' owners will contact you to schedule an appointment at your property to assess your needs, discuss your options and provide a free estimate. Thank you! One of Straight Solutions owners will be in touch with you soon to discuss your project.